During its years in Italy, Teatro dell’Eco wrote and produced several plays on commission. Two of those were about the environment (Trash and Tutto torna), especially about the importance of recycling. Trash is a documentary-theatre play that tells the story of a group of people who meet to discuss about the news in the neighborhood. During the meeting the characters are constantly bothered by a negative energy: it is Trash, who tries to tempt them with the easiness of putting all the garbage together. Luckily another spirit, Recycling, helps them in doing the right thing and start to separate waste. 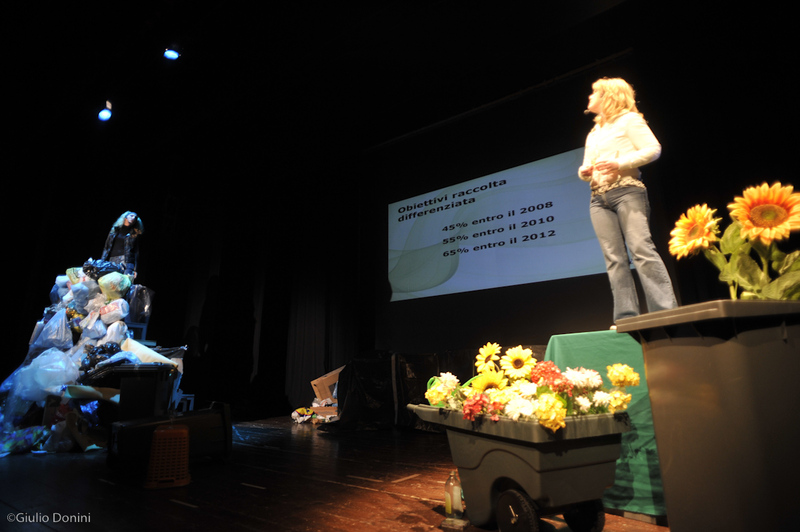 Written for an adult audience, Trash toured in North-East Italy. Tutto torna talks about the same theme of Trash but it is conceived for a younger audience. Key per Chi was commissioned by a group of private high schools that offer qualified training in several professions. Meant to perform for teen agers, it is developed on the concept of the reality show and other television programs. The participants, chosen from the audience have to guess the profession and the kind of school done by the mystery characters. The goal of this play is to help students in finding the right kind of school based on their individual skills. Lo Scio Sho is a comedy with the goal to discuss the customer service in the retail business and ways to improve the service. After many misadventures while shopping, several friends decide to start the shopping strike. Soon enough, the strike conquers the entire city. The customer representatives work together to stop this disaster. Alice delle Meraviglie ed il dott. Bianco similarly to the Scio Sho, talks about the communication toward patience in the health industry. The different characters are interpreted by the same actor creating a hilarious monologue. Oltre il tetto di vetro is another documentary-theatre play that discuss the theme of women empowerment at work. Chi ha intascato il valore delle cooperative? is a talk show that explore the world of the cooperation and its values.